Geil geist! Zufanek has a new spirits. And truly amazing spirits! We are being pushed by a desire. The desire to experience any interesting produce in distilled form, since distillation is the best form of filtration: an ideal way of retaining the sensitive natural flavours. We’ve been doing this for 17 years. And this year, we plan to expand even further. Right! We’ve reached a stage where we can dare to experiment. To choose unconventional products and to distil them in really small amounts, without worries about reaching a year-round inventory volume, with no lost output. We can distil just 50 litres and store them in our cellar for years. Or drink them ourselves. We’re good at it. Especially me, Martin. Generally, unconventional products must be distilled using different approaches. They usually cannot be fermented, as they do not contain enough sugar to be turned into alcohol, which can be fortified through distillation. Such extract spirit is usually called “geist”, after the German. A geist is the result of macerating the produce in neutral alcohol, which works as a solvent and a bearer of the aromatic oils. Macerate obtained this way is then distilled, i.e. run back through the still. In terms of the law, this is a very sensitive operation, because you are re-distilling spirit that has already been distilled and taxed, creating a new spirit that must be taxed once again. That’s why only a few Czech producers make geist – the losses are often higher than the law allows. And if there’s a significant difference between the input spirit volume and the newly distilled spirit volume, you will have to pay the excise tax loss yourself. But despite all this, we’ve successfully been producing geists for ten years, i.e. our absinthe, Borovicka, and gin. This year, we’ve finally managed to begin distilling more kinds of geist. Basically everything we find that smells good and tastes good. There may be dozens of products in the series over the next few years. But we will start with three. Sicily produces the best and most aromatic lemons in the world. They are truly unique – thanks to the climate, and especially the volcanic, mineral-laden soil. The main season starts in November and lasts until April, and we have succeeded in obtaining the first larger shipment. We need a lemon peel for distillation which must be free of chemical treatment or wax, hence the bio-quality. But the fruit must be processed promptly. So, the lemons were picked on Thursday, 6 April, we received them on Sunday, 9 April, and on Tuesday the distillation began. The result is one of the most aromatic spirits we’ve ever made. Pure essence. Perfectly preserved flavour of the best lemons. One kilo of lemons per one litre of spirit. After distillation, we had to decide the alcohol content for bottling, gradually adding water and tasting. 50 – 48 – 45 – 42 – 40 percent. First surprise: as soon as it was diluted to 50%, the spirit became cloudy. This was caused by the enormous concentration of aromatic oils from the lemons. But we’re used to this, it’s quite common, so we continued. Following diligent tasting and comparison, we’ve chosen the ideal ratio of alcohol content and flavour intensity. 42%! The meaning of life. Now, we had to experiment on a small batch to find out how to filtrate the spirit into a clear liquor. Ultimately, the roughest, essentially sterile filtration was successful. We acquired a clear spirit, which, however, lost 90% of all its flavour. The result was a light lemon-flavoured vodka, while the filter plates sparkled with the sediment of precious (and costly) oil. By filtration, we’d lost all that we’d strived for: achieving maximum flavour and aroma. The decision was made in under a second. The Sicilian lemons, as well as all other specialities in the new series of the geists, will be unfiltered! Yes, the spirit in your glass may become a bit cloudy, but you can be sure you are drinking the best of the distilled fruit without destructive filtration. Amen. We love mint. We used it for our Máta Hari, a liqueur that was meant to be a natural replacement for the classic Czech peppermint liqueur. But we miscalculated a bit. Customers kept asking why our Máta Hari is brown, not green, and why other peppermint liqueurs, unlike ours, are seeped in massive mint aroma. And we kept replying, look at the label and you will see where the green colour and the candy flavour come from – it’s full of additives and synthetic flavours. We discontinued Mata Hari last year. But not our desire to produce something with mint. So now we will distil it! And not the conventional mint, but Moroccan nana mint. You may know it from your travels in Africa or from tea shops. Compared to common peppermint, nana has a greater menthol content, but instead of being pungent, it is mildly sweet. That’s why tea prepared from this mint variation doesn’t need to be sweetened. Can you imagine Czech bread without caraway? Or boiled potatoes? Or roast goose? A superior-quality caraway variety, one with the EU Protected Designation of Origin status, is grown in the Czech Republic. However, due to higher prices, Czech caraway is largely exported, only to be replaced on the domestic market by imported, cheaper caraway varieties. And quite inferior. The very best caraway is being grown just 14 km from our distillery. You may know it from our Kontusovka, where it is, however, just one among eight other herbs, so it could not show its full potential. Until now. Our new caraway liqueur is as genuine as could be. A pretty large amount of the most aromatic local caraway, slow distillation, no sugar and no filtration. 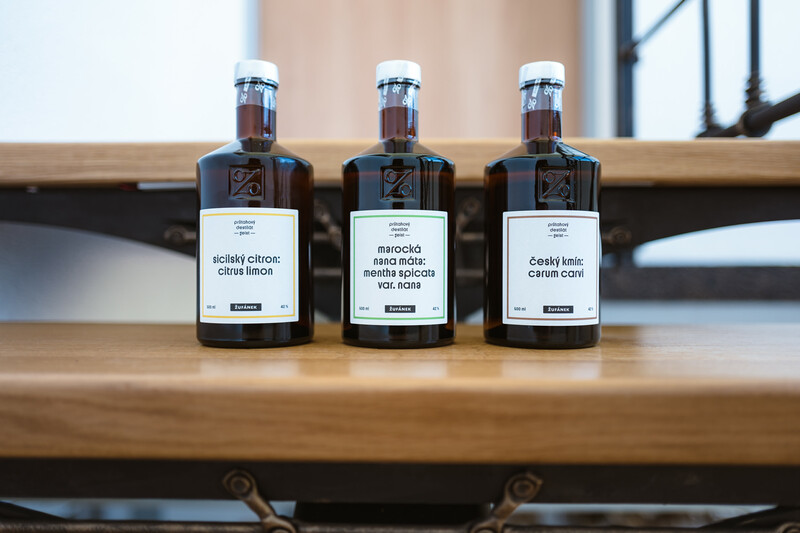 You may remember the Czech “kmínka” or popular German or French kümmel liqueurs full of sugar, but when drinking our liqueur, you’ll taste pure Czech caraway in the best state possible. The liquid state. And this is only the start. We already know what will be distilled in the months to come. We just need to wait until the produce grows and matures. You have much to look forward to! We can’t wait, ourselves. Labels for the new products are the purest and simplest we’ve ever had. We just specify the name of the base material, and we’ve changed the border colour. But we’ve still managed to make it eye-catching enough. We pay tribute to one of the pioneers of modern graphic design, Ladislav Sutnar, who designed part of the alphabet and numbers for house numbers in the Bronx in 1958. His collection was later expanded and finished by Tomáš Brousil. We borrowed two stylistic sets – the basic narrow alphabet and the version with letters derived from a circle (a, b, c, d, e,…), so the round “a” alternates with the classic letter in a seemingly random order. The result is a slightly “drunken” type caused by the disparate width of the characters in the lettering, which is great! All the spirits are very carefully and very slowly distilled in our Arnold Holstein stills, bought specifically for these aromatic, full-flavour specialties. Here’s to your taste buds!